This most interesting surname is one of the dialectal variants of either "Hebburn" in Durham recorded "Heabyrm" circa 1104 in the Symeon of Durham, or "Hebron" in Northumberland, appearing as "Heburn" in the 1242 Feet of Fines. Both places are composed of the old English "heah", high, plus the old English "byrgen", burial mound, tumulus. 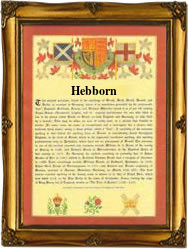 Other variants of the name include Hebborn, Hebburn, Hebborne, Ebourne, etc.. The "H" at the beginning was dropped as a result of variations in pronunciation. During the Middle Ages, when migration for the purpose of job seeking was becoming more common, people often took their former village name as a means of identification, thus placenames became one of the main influences in surname formation. The London Church Registers record the following early entries of the surname: Edward and Elizabeth Eburn, children of Thomas Eburn were christened at St. Andrew by the Wardrobe, on April 16th 1593 and November 16th 1595 respectively. Anne Eborne married John Dervin at St. Lawrence Jewry and St. Mary Magdalene, Milk Street, London on September 3rd 1598. John Eborn married Elizabeth Gregory at St. Katherine by the Tower, London on August 3rd 1685. The first recorded spelling of the family name is shown to be that of Adam de Hepburne, which was dated 1271, in Archaelogia Aeliana, (Scotland), during the reign of King Alexander 111, known as "The Ruler of Scotland", 1249 - 1286. Surnames became necessary when governments introduced personal taxation. In England this was known as Poll Tax. Throughout the centuries, surnames in every country have continued to "develop" often leading to astonishing variants of the original spelling.